More Hawaiian Chocolate & Macadamia Nuts. "This is real Hawaiian Host. Genuine. Classic. Original. It truly is Hawaii's Gift to the World. Premium, dry roasted macadamia nuts covered in generous layers of island chocolate prepared using a unique Hawaiian Host recipe. An essential treat for personal or gift-giving enjoyment. 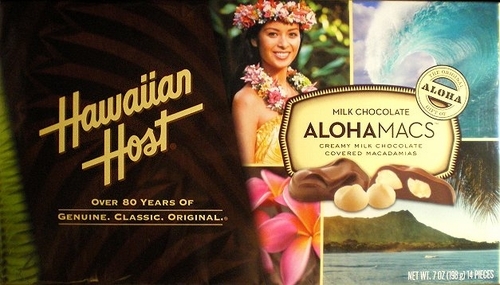 Stunning, glossy box with Hawaii's scenic views, beautiful hula girl and precious Tiki design hosting delectable pieces of chocolate covered macadamia nuts. Comes with Hawai'i post card. Please enter your gift message in the Comments field during checkout. Note: Packaging for this product was changed after a new gorgeous cover girl was proudly selected through a contest held in Hawaii. Also Available: Choose White Chocolate or Dark Chocolate from the menu below. We also offer Set of 6 Boxes with free shipping by air mail in U.S. (item CH22124-s6 only, select AlohaMacs option). Order Processing Time: Ships in two weeks. For warm weather seasons, warm weather states and shipments to RI, please select 2nd Day Air or Express shipping option for all chocolate covered macadamia nuts. Limit 12 boxes per customer in one order. You may place additional orders. Ingredients: Milk chocolate (sugar, cocoa butter, chocolate, milk, butterfat, soy lecithin - an emulsifier, vanillin - an artificial flavor), dry roasted macadamia nuts. "Since boyhood, Mamoru Takitani had dreamed of being a candy maker. Not just any candy maker, mind you, but The Best Candy Maker That Ever Was. When his magical recipe for chocolate-dipped macadamia nuts created a sensation on his home island of Maui, he decided it was time. Moving to Honolulu, Mamoru purchased Ellen Dye Candies, a local confectioner since 1927, and renamed the company Hawaiian Host. Armed with his fabulous recipe, he was soon filling orders all over Oahu. Islanders loved the rich, creamy flavor of Mamoru's little masterpieces. Visitors discovered them to be a perfect gift for the folks back home. And competitors everywhere tried desperately to copy them. Oh yes, Hawaiian Host has been imitated by many over the years but the unique quality of our secret milk chocolate has never been equaled. You are about to experience the world famous flavor that has made it a legend from the very beginning."